Gate Episode 13: An Earth-Shattering Experience! 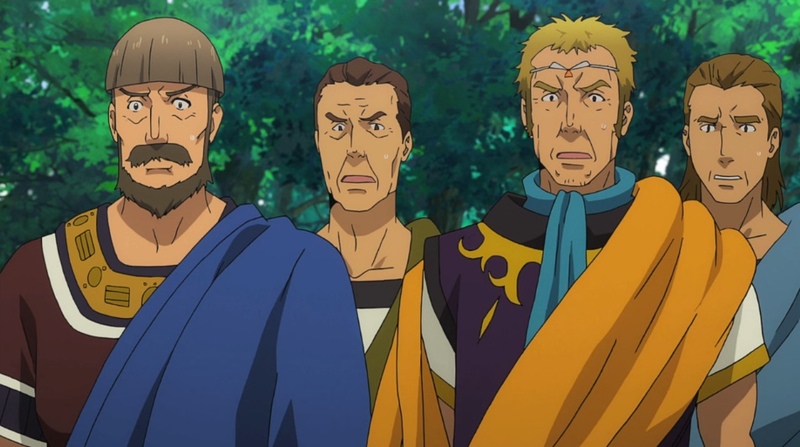 Gate Episode 13 (or season 1 episode 1) digs deeper into the empire’s depravity. It also shows that getting to know the down-trodden can be life-saving! If you enjoyed the soundtrack, you can buy it from Amazon! Working with Princess Pina Co Lada, Koji Sugawara of the Japanese diplomatic team host a garden party for the peace-leaning senators and their families. Sugawara makes sure his best chefs are there so woo the families. But the real reason for the get together is for Japanese Self Defense Force (JSDF) First Lieutenant Yoji Itami and his team to demonstrate the capabilities of their small arms to the senators. The goal is tohelp these senators understand the situation they’re in. The JSDF’s rifle fire impressed the senators. And they hadn’t even seen the mortars yet! Capture from the Crunchyroll stream. Meanwhile, Crown Prince Zolzal El Caesar is forcing Tyuule, a former chieftain of the Warrior Bunnies, into degrading and rough sexual acts. These acts are payment for him keeping her people from annihilation. A count interrupts him with news of the party that Pina is hosting. Convinced the count gave him the information exclusively instead of the emperor, he leaves to crash the party. He arrives to find only the senator’s families; Itami’s team noticed their approach and gave the senators time to escape unnoticed. Pina suggests Zolzal try some of the fine cooking, and he is so impressed that he forgets why he came. In Japan, the new Prime Minister struggles to manage public perception and pressure from the other nations. The emperor is well aware of the negotiations. In fact, the count had given Zolzal the information with the emperor’s consent to convey an indirect warning to Pina that he and the emperor were aware. The emperor has no intention of negotiating with Japan. His plan is to manipulate events to destroy the senate and make Japan give up in frustration. After the party, some members of Recon team 3 (Itami’s team) are assigned to the capital’s red light district to support the JSDF aid station there. They put Sergeant Mari Kurokawa to work right away helping the prostitutes. Kurokawa’s gentle manner wins the trust of red light district workers like Misery, who buys contraceptives from the JSDF. Misery confides in Kurokawa that she and her friends feel very, very safe when they’re around the JSDF. The entire red light district is dangerous, and an armed gang tried to oust the JSDF when the first setup their station. Moments after the attack began, the JSDF had killed all of the assailants, and now all of the gangs in the red light district try to stay on good terms with them. Misery does complain that the JSDF men won’t buy her services. Kurokawa just listens, aware of the medical report of sexually-transmitted diseases in the special zone on the table behind her. Misery’s tragic smile says a lot about the conditions under which she works. Capture from the Crunchyroll stream. Lao Ro Dushi seems to have decided to use extortion to force Itami to help her. 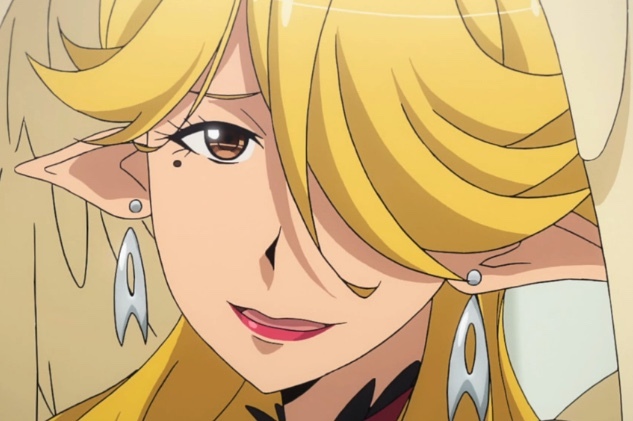 She uses beer to bribe Myuute Luna Sires into disclosing that there are three people outside of the JSDF that Itami values enough to risk his life. After dark, many of the red light district workers converge on the aid station. Many of them are uneasy; one says she feels the same way she did in her homeland before a volcano erupted. The Chief of the station had seen something similar among the pets and wildlife in Japan just before an earthquake, so he believed them. They ordered everyone out of the buildings. Itami and others in his team had been staying with Pina in one of her mansions. They received the warning just in time to get outside just before the earthquake hits the capital. This season seems to dig deeper into the politics and maneuvering of the various factions. It’s so realistic that it’s almost depressing. 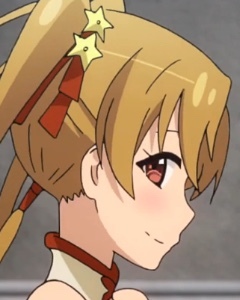 For example, during the party, Pina helps Sugawara realize why Italica sent only human maids, despite some of their best maids being non-human: the Imperial capital is prejudiced against them. That prejudice plays out in the empire’s politics, in the slums within the capital, and in Zolzal’s actions against Tyuule. At the party, in the background, you can see one of the children playing with a soccer ball. Looks like Japanese culture is making inroads among the important families! Itami’s team used imperial armor and shields as target practice to demo their Type 64 Battle Rifles to the senators. Can you imagine being a senator and seeing your military’s finest arms tattered from 25 meters away? Many of the senators immediately wanted to buy the rifles. I thought this was a very realistic reaction! The animation in this episode continues to delight. Though it was a minor piece of the action (seemingly), Sherry Tyueli complains to Sugawara about her lack of a necklace. When Sugawara promises to get one for her if she’s good, the shy and appreciative look she gives him was precious. Little details — little character moments — really make a series for me. Gate has a lot of them! Capture from the Crunchyroll stream. Kurokawa doesn’t chide Misery for smoking narcotics. Kurokawa knows Misery needs them to get her through days that are filled with terrible experiences. Misery’s expression as she said she only had one useful skill was heartbreaking. How often have we seen politics or circumstance or cruelty break people’s spirits until they no longer believe in their own self-worth? Tragic. Little details can make or break a show for me, and Gate is in the former camp. For example: Sires Myuute Luna Sires starts to feel cold and wonders if she’s had too much to drink. Apparently, beer affects sirens differently than humans. Leilei, Tuka, and Rory weren’t completely absent from this episode. But still! Capture from the Crunchyroll stream. There wasn’t enough Rory Mercury in this episode. I have to wait another week for episode 2. This episode had a ton going on. In a good way! Negotiations between Japan and the imperial senate are beginning in earnest. Several of the senators now understand what it means to face a military that’s hundreds of years ahead of theirs, and those senators are motivated to push for peace. At the same time, it’s more clear to me what the emperor is up to: he’s going to use any means necessary to stall the talks until the Japanese get frustrated and simply break things off. It might be a good plan for people whose motivations he understands. I don’t think it’s going to work well for him in this case. Since the JSDF has setup an aid station in the capital’s red light district, it seems they’re trying to build a good relationship with the locals, especially those who are at the margins of society. That makes good sense: first, those at the margins are usually ignored, so the JSDF will have more time to work with them before any intervention. Second, if the emperor falls suddenly (and he might, given the disparity of technology and tactics), there’d be a sudden power vacuum. If the people trust the JSDF to treat them well, they’d be on their way to establishing peace. So Lao Ro Dushi has learned that there are three people that Itami cares about outside the JSDF? I have not read the manga, so I’m only guessing here, but I’m afraid she’s planning to kidnap one of them. I can’t see her trying to kidnap Rory (that’d be fatal). Lelei La Lalena’s magical powers seem to make her safe. I’m worried about Tuka Luna Marceau — as if she needs any more problems! I have a new favorite villain, and by favorite, I mean a character I want to see get the punishment he deserves: Zolzal. Sometimes, I just want a villain to hate. Complex villains are more interesting, and I usually prefer them. There’s something refreshing, though, in pure hatred. I can’t remember the last time I hated a character this much. He’s the epitome of everything that can be wrong in a human. He’s cruel, he’s arrogant, he has a false sense of his own intelligence, and he’s unconsciously superior to anyone not of his race. He mistreats everyone around him; some, like Tyuule, to an extreme. He needs to get his, and the sooner, the better. Did I mention that I really don’t like that guy? In addition to everything I’ve mentioned so far, what made this episode memorable were its tone and scope. The first season largely glossed over some of the darker aspects of the empire, and that was okay. 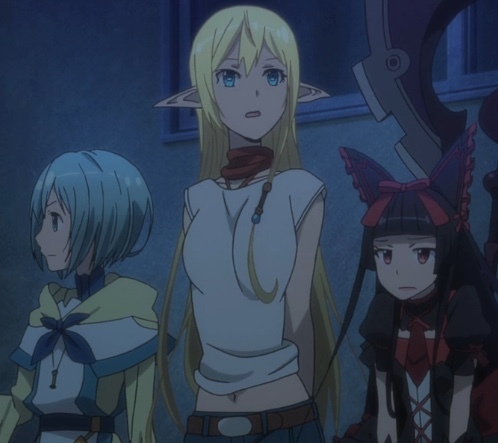 Gate focused on introducing us to its concepts and main characters. Now, we’re beginning to see why the empire has to be put down. It treats its people terribly (except for the nobility) and its leadership is morally despicable. Plus, we’re beginning to see how many of the characters have their own agendas, and I have a feeling how they act on those agendas will have a major impact on the plot. This was a great start to the second season!